If you spend some time looking for, or looking at, Tauchnitz Editions, it won’t be long before you come across one or two that are bound in vellum, with old albumen tourist photos of Italy bound in at various places throughout the text. They’re often attractively decorated on the front cover, sometimes very elaborately, and often still in relatively good condition for books that are well over 100 years old. Booksellers seem to have very little idea of how to value them, and I’ve seen them for sale at prices varying from two or three pounds to many hundreds of pounds. From a book collector’s point of view they’re a nuisance. The same titles are found over and over again, almost all Italian-themed novels or travel books, almost always reprints and usually with the half-title page missing. Or anyway from my point of view, as someone who collects Tauchnitz first printings, they’re a nuisance. I guess there may be some book collectors who find them more interesting than the standard unadorned Tauchnitz editions. I assume most of the copies priced in the hundreds of pounds go unsold, but there may be some buyers out there to justify the high prices. The most famous Tauchnitz collectors of all, William Todd and Ann Bowden, who compiled the Tauchnitz bibliography, did have some time for them, if only as a curiosity. Alongside their main Tauchnitz collection, which ended up at the British Museum, they put together a separate collection of the extra-illustrated editions, which is now at the Princeton University Library. The books seem to have been produced and sold as travel souvenirs, to some extent almost as guide books, with tourists visiting the sites mentioned in the stories. Although produced in huge numbers, each book seems to be almost a one-off, with no two copies identical. The cover designs all seem to be slightly different, and the choice of photographs is always different too, as is the number of photographs, which can range up to almost 100. Did customers design their own book in some way, making their own choice of photographs and of design, possibly pasting photographs onto blank leaves inserted into the binding? The choice of books though seems to be much more limited than the choice of designs. The most common title by far is Nathaniel Hawthorne’s ‘Transformation’, which has an alternative title of ‘The romance of Monte Beni’ on the title page but is often referred to as ‘The marble faun’ on the covers, the title by which the book is known in America. This book alone accounts for 37 of the 53 books in the Todd collection at Princeton, and there are around another 30 copies of it currently offered for sale on ABE, at prices ranging from £10 to £450. The story of ‘The Marble Faun’ is set in Rome and it’s usually found illustrated with postcards of Rome. The next most common title, ‘Romola’ by George Eliot, is set in Florence and usually found illustrated by postcards of Florence. Other titles include ‘Pictures of old Rome’ by Frances Elliot, ‘The last days of Pompeii’ and ‘Rienzi’ both by Edward Bulwer Lytton, and ‘Lays of Ancient Rome’ by Macaulay. For Tauchnitz, the trade must have been a blessing, massively increasing sales of titles that might otherwise have sold relatively few copies. ‘Romola’ had been one of George Eliot’s least successful novels, when first issued in 1863, but probably ended up as one of Tauchnitz’s best selling titles after being taken up by the Italian tourist trade some 20 years later. 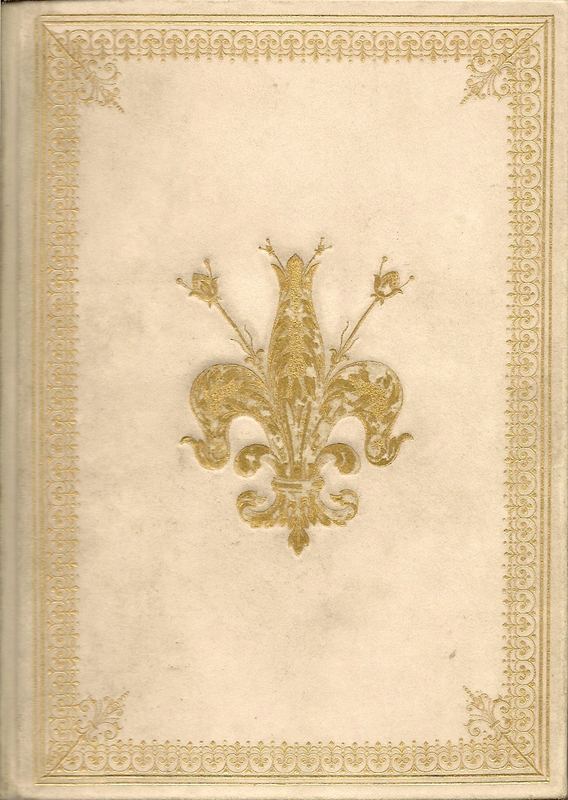 Not all of the Italian vellum bindings have postcards bound in. Some like the copy of ‘The divine comedy’ illustrated above, look similar externally, but have no photos. There is also another range of elaborate custom bindings, almost all on Italian themed books, that I’ll come back to another time. One of the most intriguing titles to have been given the Italian travel souvenir treatment is ‘Childe Harold’s pilgrimage’ by Byron, which was issued in 1862 as the first book in the short series of Tauchnitz ‘Cabinet Editions’. These were, for Tauchnitz, ‘de-luxe’ editions in a smaller format than usual, nicely bound with gilt edges, and selling at a premium price. They were not a success. The series ran to only four titles, and most are now very difficult to find. Like ‘Romola’ and ‘Transformation’ though, ‘Childe Harold’ seems to have enjoyed a second opportunity when it was discovered by the Italian binders. Too small to have postcards inserted, it was nevertheless given a wide variety of vellum bindings and is now signficantly easier to find than the other volumes in the series. I should be clear up front. ‘Middlemarch’ does not appear in the Tauchnitz series. It’s probably the single most famous novel from the whole of 19th century or early 20th century English literature that never appeared in a Tauchnitz Edition. The story of how and why it went missing can be found here. George Eliot without Middlemarch may seem a bit like Hamlet without the Prince, but the author of ‘Silas Marner’ and ‘The mill on the Floss’ amongst others, would deserve her place in history even without Middlemarch. The first of Eliot’s works to be published in book form was ‘Scenes of Clerical Life’, reprinting a series of articles from Blackwood’s Magazine. It first appeared in the UK in 1858 and the two-volume continental edition followed in February 1859 as volumes 462 and 463 of the Tauchnitz series. Tauchnitz had offered £30 in November 1858 for the continental rights, as recorded in Eliot’s letters, later also published in a Tauchnitz Edition. As always the Tauchnitz volumes were issued as paperbacks, although no copy of the 1st printing is known to have survived in its original wrappers. I believe the copy pictured above is the earliest known paperback copy. The back wrappers advertise the 15th edition of the Tauchnitz English-German dictionary, which date them to 1864 – 1865 and other titles advertised in the series confirm a date of 1864. Most other surviving copies have been privately bound, and the original wrappers discarded. They then can’t be dated as precisely, but examples of the first printing should list no other titles by Eliot on the half-title verso. In July of 1859 Tauchnitz paid Eliot a further £87 10s, made up of £50 for ‘Adam Bede’ and £37 10s for her novella, ‘The lifted veil’. ‘Adam Bede’ was published immediately as volumes 482 and 483, and reprinted many times by Tauchnitz over the next 80 years, but ‘The lifted veil’ was held back and did not appear in the series until almost 20 years later. It seems very untypical of Tauchnitz to pay for a work and not publish it, but ‘The lifted veil’ is untypical of George Eliot, so perhaps it was appropriate. It was also too short to fill a volume of the Tauchnitz Edition on it own, so perhaps had to wait for a suitable accompaniment. As always, copies of ‘Adam Bede’ in the original wrappers are scarce. 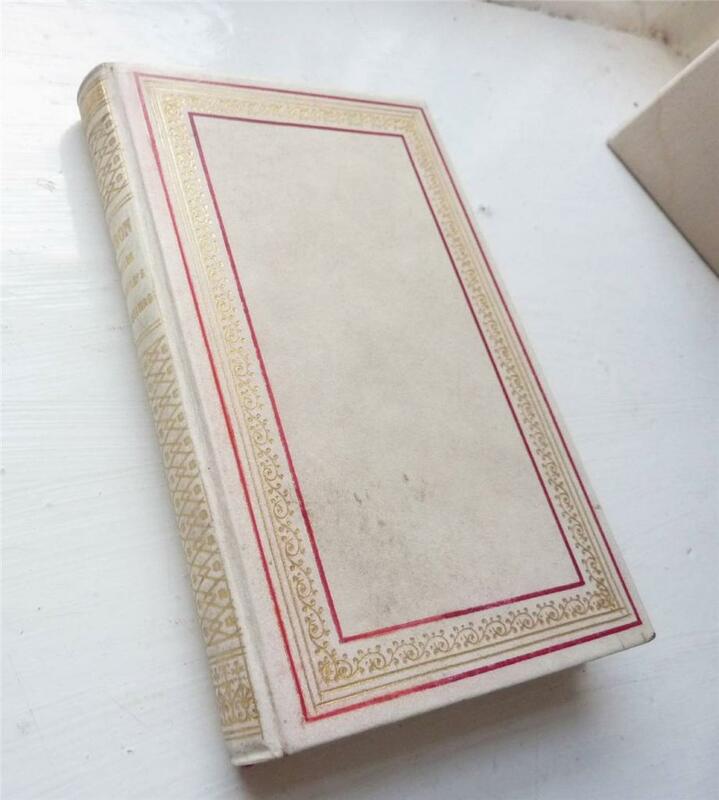 The less-than-perfect copy pictured above is certainly very close to a first printing, with the list of other titles on the wrappers going up to ‘Barchester Towers’ by Trollope (volumes 491 and 492), published in October 1859. It may be that again this is the earliest known surviving copy, although the Tauchnitz bibliography lists two other early copies (in Budapest and in Western Ontario) advertising the 11th edition of the Tauchnitz English-German dictionary, which puts them no later than the end of 1860. It’s interesting to look at Eliot’s choice of a male pseudonym in the Tauchnitz context. In 1859, when her first works appeared, around 40% of all novels published by Tauchnitz were by female authors and by 1865 the women were at parity, if not in a small majority – a position that they maintained for most of the next 20 years. So it was clearly not that she would have had any difficulty in getting published under her own name. But there was undoubtedly a difference in the type of novel published by female authors, which tended to be light romances, or more often, sensation novels – the style popularised by Mary Braddon and Mrs. Henry Wood, as well as Wilkie Collins. Eliot had published an anonymous essay in 1856 attacking ‘Silly novels by Lady novelists’ and clearly did not want her own work to be categorised in this way. Despite sitting on ‘The lifted veil’, Tauchnitz was keen to publish all of the novels of George Eliot as soon as they were available. ‘The mill on the Floss’ appeared in April 1860, only a matter of weeks after the first UK publication, as volumes 509 and 510. The price paid increased again to £100, presumably on the basis of the successful sales of ‘Adam Bede’. ‘Silas Marner’ followed in May 1861 as volume 550 and then ‘Romola’ in December 1863 as volumes 682 and 683. 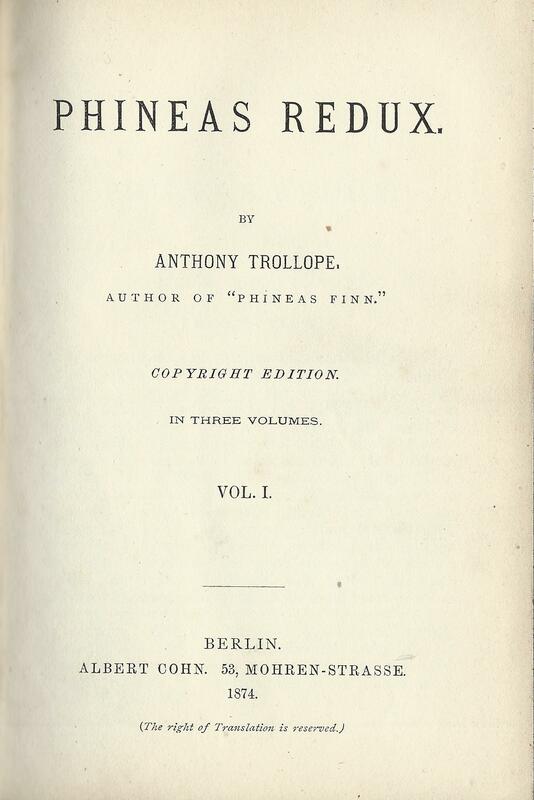 First printing of Silas Marner, with a quotation on half-title verso, but no other titles listed. For all of these volumes, the first printings according to the bibliography should not list any other titles by Eliot on the half-title verso, as well as conforming on other points too detailed to mention here. However it’s worth noting that for other Tauchnitz volumes issued around the same time, versions with no other titles listed, and versions with all previous titles listed, seem to have been issued more or less simultaneously. A version of ‘Silas Marner’ exists listing only the three Eliot works published ahead of it, and a version of ‘Romola’ listing only the four previously published titles. It’s possible, particularly in the case of ‘Romola’, that both versions were published simultaneously. However my paperback copy (again I think the earliest known copy) shows no later published titles in the advertising on the wrappers, so is almost certainly a first printing, and it has no other titles listed. ‘Romola’ was not as commercially successful in the UK as Eliot’s earlier novels, and the same may have been true on the continent in the first few years. Early copies are relatively scarce. In the long run though, it was almost certainly the most successful in sales terms of all the Eliot novels published by Tauchnitz, because it was taken up for sale as a travel souvenir by the Italian book trade. 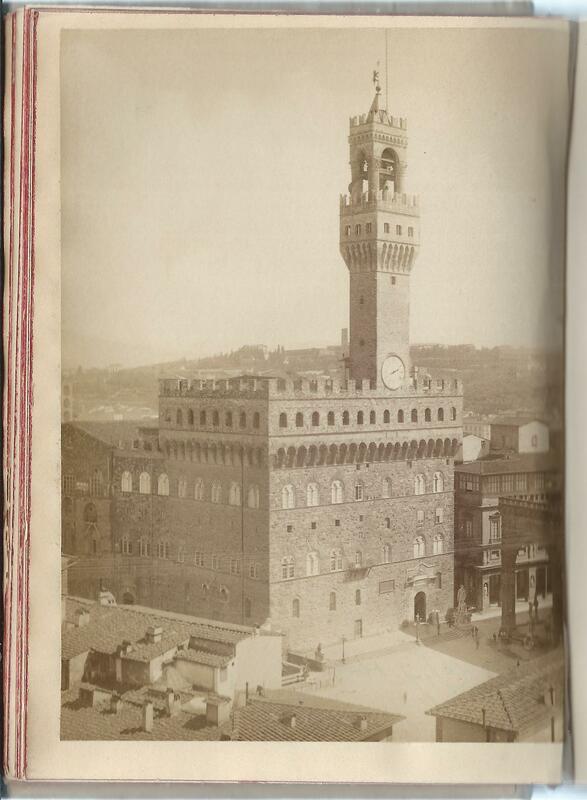 A series of Tauchnitz Editions, all with Italian settings, were sold in large numbers in Italy, in custom made vellum bindings, often richly decorated, and extra-illustrated with albumen tourist postcards bound in. They seem to date mostly from around the 1880s, so are almost always reprints, although as the half-titles are rarely bound in, they are impossible to date accurately. ‘Romola’, with its Florentine setting, seems to exist mostly in bindings by G. Giannini in Florence, with postcards of Florence bound in. By the end of 1863 (and the end of this first part), the Tauchnitz series contained a total of 9 volumes by George Eliot, and covered all four of her novels up to that date. There is some evidence of early reprints, but from what evidence there is, I suspect that sales were respectable, but not outstanding in the early years. Tauchnitz probably sold enough to make them profitable, which may have been as few as 2,000 copies or so, but the real value came from the fact that they continued to sell, year after year. There were certainly plenty of reprints later on, and Tauchnitz bought the copyright of almost all the books he published with a single advance payment rather than ongoing royalties. So it was books that generated continuing sales that became the most profitable over the long term, and Eliot’s novels were certainly in this category. I’ll come back to the story of George Eliot’s later works in a second post.